I didn’t have any time last week to review Dawn of the Planet of the Apes because I was on vacation. Simple as that. But I’m back, and I saw the film at 11:30 this morning. I wanted to see the film that early in the morning because I was a really big fan of the last Planet of the Apes film, Rise of the Planet of the Apes (these titles are all mouthfuls). It was surprisingly the best film of that summer when it was released, and it let the world know that Andy Serkis is an actor that should be paid attention to, even if he’s covered in dots and balls while on the sets of his film for the motion capture work. Dawn has been heavily anticipated for quite sometime now, with Matt Reeves, director of Cloverfield, taking over as well as a new human cast of Jason Clarke, Gary Oldman, and more. The reviews have been very enthusiastic for the sequel, and I gotta agree with them. Here’s the review. Andy Serkis reprises his role as Caesar, the leader of the Ape revolution. As mentioned, a plague has struck the human population, with nearly all of civilization being wiped out, and the Apes ruling the world we once called ours. However, there are a good deal of people still in San Francisco, which is not far from where the Apes have set up camp in Northern California. A group of humans, particularly Jason Clarke and Keri Russell as a couple, find Caesar and try to ease tensions between the two races, but opposing factors in both parties try to end the peace. The film was once again written by Amanda Silver, Mark Bomback, and Rick Jaffa, with Jaffa and Silver having previously written Rise together. And like that previous film, Dawn sets itself apart in a drastic way from your typical summer blockbuster. The filmmakers put a lot of time into the emotional resonance of these characters, particularly with Caesar, which is another flawless performance by Andy Serkis, who continues to be the best actor you don’t know of in Hollywood. Thanks to Serkis and the folks at Weta Digital that helped Caesar come to life, the motion capture work is the best I’ve ever seen on film, period. The effects in the last film were terrific, but when you see the faces and the fur of the apes, I kind of thought for a second that these were actual apes interacting with the human actors. It’s quite spectacular to watch, and I found all of the scenes with the Apes to be even more emotional and interesting than the human stories. That’s not saying that the humans are bad in the film, in fact they’re all really good. Jason Clarke has quickly become one of my favorite actors after his incredible turn in Zero Dark Thirty a few years back. His son in the film, played by Kodi Smit-McPhee, is also very good in the film, even if he’s a bit underused. Keri Russell, who worked with Reeves on his television series Felicity, also does some of her best film work here. But the real star here is of course Mr. Serkis and the rest of the motion capture actors in the film, which continues to astound me with how realistic and fluid it looked the entire time. The work that Mr. Serkis has done is this film has left me speechless, to the point where I’m having to publish this review a day after I begun writing it. This new age of the motion capture actor is something that Hollywood must accept soon, and I hope that this go around, Mr. Serkis gets a good deal of recognition for his work in this film come January. The action also in this film is also amped up, and it’s shot beautifully by Michael Seresin, with Mr. Seresin and Matt Reeves shooting the film in 3D, and I have to say that the 3D is gorgeous. The sweeping shots of the apes in the woods is quite breathtaking, and the final 40 minutes of the film is quite thrilling. If I had any complaints with the film, it’s that there are some small, minor characters that can be pretty annoying and irritating throughout the film, however their appearances are brief and it doesn’t spoil the rest of the film. Even though it’s been a week, and chances are that you’ve already seen this film, but if you haven’t, Dawn of the Planet of the Apes is probably the best summer blockbuster of 2014 by far. 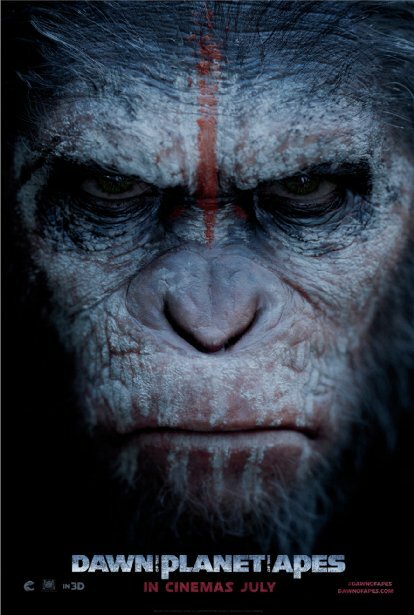 It’s exciting, it’s emotional, and it feels important and real, and for a film that’s just about apes taking over the world, it’s saying a lot. Of course it doesn’t touch Rod Sterling’s classic script to the original Planet of the Apes, but I really love that Fox is using this franchise to its benefit, as it’s sort of remaking the crappy sequels to Planet of the Apes from the 1970’s. Matt Reeves has already signed on for a third Apes film, and if it can be as good or even better than Dawn, I’m sold. July 18, 2014 in 2014 Film Reviews, Movie Reviews.